Excuse the poor photo, the only time The Toddler is remotely still is when he's nursing and even then he has a penchant for gymnastics. So, Baltic Amber. 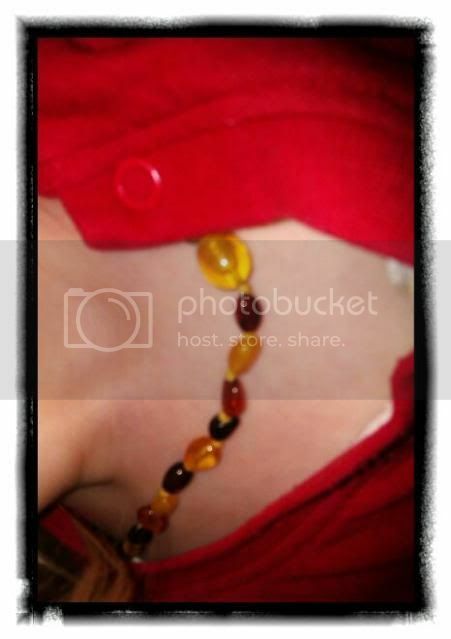 Specifically Baltic Amber teething necklaces. For those who've never heard of them, Baltic amber is the only fossil resin that contains 3-8% succinic acid. The amber warms when in contact with skin and releases an oil that has analgesic properties. It's been used for many centuries and is especially popular on the continent. When Thing One was a baby I had no idea they existed. Thing Two got one as a freebie but by then she had all her teeth. The Toddler has had his necklace since he was really quite a small baby. It has been taken off only a handful of times in his life, the only time that immediately springs to mind is when he needed a chest X-ray. Otherwise he wears it 24/7, yes even in the bath. Does it work though? Good question. All I can say is that he has a mouthful of teeth and half of them I had no idea where on there way until they'd already arrived. He rarely drools or has red cheeks. When teething he doesn't scream and cry, he just feeds even longer then usual (i.e throughout the entire day and night). Even his molars have been no issue. Infact the only issues with teething we've had is occasionally they bring upon cold symptoms and this exacerbates his breathing issues and has resulted with him being taken to hospital three times in four months. Just this week, he was giggling away and I took the opportunity to glance in his mouth and saw a tooth emerging, we had no idea yet in retrospect is does explain why he's upped his nursing antics lately. So around a year ago I decided to purchase myself an Baltic Amber necklace and bracelet. Amber bracelets are highly effective for controlling the pain of rheumatism, arthritis, and aching muscles and joints whereas necklaces can provide significant pain relief for head, neck and throat areas Baltic amber is also an anti-anxiety remedy that rids fatigue and weariness. As someone who suffers from Myalgic Encephalomyelitis, anxiety and depression I figured I could benefit from it. Unfortunately despite the amazing effect it appears to have on The Toddler I can't say I noticed any affect at all. Yet, before we completely write it off as total twaddle it's important to remember not all Baltic Amber that is sold is actually genuine. There are some very simple tests to check the authenticity of Baltic Amber if you're at all in doubt. Unfortunately I am doubtful of the authenticity of mine after carrying out the acetone test on my bracelet which may explain things. 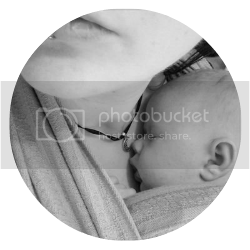 However, I feel I must mention that recently many small companies are recalling baby teething necklaces due to Trading Standards investigating the safety of infants wearing them so many makers are now having to market them at being suitable for for 3yrs and over. There have been no incidents reported connected with them, it's purely speculation of potential danger. I know one thing though, I won't be returning The Toddlers. It's invaluable. I often think it doesn't matter if you can rationalise why something works, as long as it works. I was part of a discussion about homeopathy a while back and had to admit that the explanations of how it works are ridiculous, just laughable but that I used one on my 6m old (nelsons teething powders) and it worked. I may not be able to explain to a rational scientist why it worked, no homepathic medicine has EVER worked for me but those powders bloody did work and I wasn't going to stop using them!